Dementia and memory loss bring a deep sense that something precious is slipping away — both for the elder who is experiencing it and for their loved ones. The Memory Care program at The Villas of Guerin Woods is unique in many ways, but primarily in its focus on their unique strengths and interests that remain rather than on what has been lost. Every Elder has his or her own beautiful story, written over the course of a lifetime. We believe passionately in continuing that story for those who are experiencing memory loss, creating a joyful and meaningful life with each new day. Here, elders are recognized and treated as the unique individuals they are. Our staff strive to compile and preserve each Elders’ life story through reminiscence; then we can remember for them, and support them in the retention of their identity by re-telling and affirming their life story. Because Elders with memory loss are coping with a debilitating disease, we provide frequent praise, encouragement, opportunities for success, specialized approaches, and at all times, a profound respect for their personhood. Our specially-trained compatissants communicate with sensitivity and empathy to validate the feelings and identity of each Elder. This diminishes the isolation and loneliness so often experienced by those with dementia. We also recognize that behaviors are a form of communication, and so we seek to understand those messages as well. Meal times at Guerin nourish both body and spirit. Our dining room tables welcome small groups of Elders to prevent over-stimulation. Specially chosen tableware and contrasting colors compensate for dementia-related vision deficiencies. Avoiding processed foods, our home-cooked meals are supplemented by two substantial snacks each day to fulfill the nutritional needs of Elders. Much memory care today employs disease-focused thinking, which accentuates disabilities and personal deficits. Guerin creates a strength-based plan of care for each Elder that looks beyond limitations to abilities. Our compatissants recognize and respect each Elder’s own initiative and abilities, and enter into a respectful care partnership with them. Elders receive encouragement and assistance of their compatissants, to self-perform tasks of daily living to the extent they are able. Elders’ preferences and choices are vital to this care partnership. Families are always welcome, and if visiting during meals, are always offered a place at the table. We value family involvement and consider them essential collaborators. Families and friends of Elders with memory loss are offered education to enhance their understanding of dementia, offer consolation and hope, and teach techniques of communication that will help them connect with and share their loved ones’ reality. Families are also invited to participate in a Care Contract through which we forge a partnership of care that honors and upholds their past and present contributions while allowing us to continue the journey together. Planned events allow families and Elders, including those in the larger community, to enjoy enriching activities together with others who appreciate and understand the exigencies of dementia. The present moment is vital to the Elder with memory loss, and so a celebration of life permeates our Memory Care Villa every day. We not only rejoice on special occasions, but also affirm through words, actions and smiles that every moment of life is intrinsically joyful. Our person-centered approach recognizes individual preferences in activities and occupations. Because unstructured time is meaningless to Elders with dementia, we work to provide a consistent, meaningful and life enhancing routine each day. Music resonates deeply for those with memory loss. 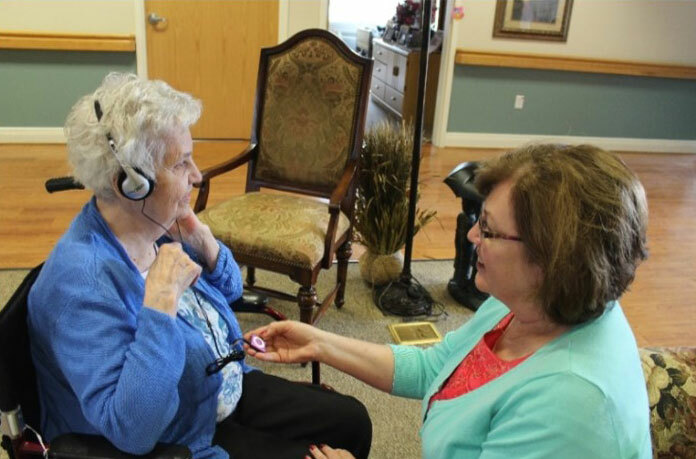 Music and Memory is a personalized music therapy program that taps deep memories not lost to dementia. This brings Elders joy, enhances self-awareness of identity, increases cooperation and attention, reduces resistance to care and offers a viable alternative to antipsychotic medications to manage sun-downing and behaviors. We recognize the fragility that memory loss creates. The architectural design of the Memory Care Villa offers a warm, safe environment that promotes autonomy and makes the heart feel at home. All aspects of the décor and design of the Memory Care Villa have been thoughtfully chosen to promote the independence and comfort of the Elder with memory loss, including familiar furniture styles, comfy lazy boys and stationary rockers. Our lighting plan includes enhanced natural light and nightlights in bedrooms to increase safety, decrease risk of falls and soothe agitation related to the phenomena of dementia sun-downing. Each Elder is encouraged to bring cherished furniture from home to personalize their private room, which includes a double paned window and their own bathroom with shower. Beautifully hand-crafted shadow boxes at the entry of each Elder’s bedroom display artifacts from the Elder’s life and interests, enhancing awareness of identity and promoting way-finding. Reminiscent scrapbooks and daily journals are thoughtfully crafted by family and staff for each Elder. Each Elder also has a personalized “My Page” on IN2L (It’s Never Too Late technology for seniors) which displays relevant photos representing their life story as well as their favorite personal options including music, games, videos, and websites. A spacious sunroom bathes Elders with natural light and offers a lovely view of the garden, while boosting orientation to time and season. A walk-out enclosed garden stimulates the senses and provides a sacred space for quiet reflection or pleasant family encounters. An Ariel Wander Guard system and a vestibule with a double door exit promotes security for Elders who wander, while hand painted murals across exit areas deflect attention and offer beauty. Rather than complacently treating the effects of memory loss, we closely track and adopt new innovations for improving and enhancing cognitive function. We remain at the forefront of new developments in memory care, and strive for excellence in the provision of appropriate, ongoing medical treatment. We desire to limit the use of antipsychotic medications for Elders with dementia by offering whole person care. This includes occupational and recreational activities, evidence-based holistic nursing practices, an individualized approach to interpreting and managing behaviors and a healing environment. Our goal in everything that we do is to provide the Elders in our Memory Care Villa with a full and happy life that celebrates all of the beautiful qualities and abilities that make them who they are.